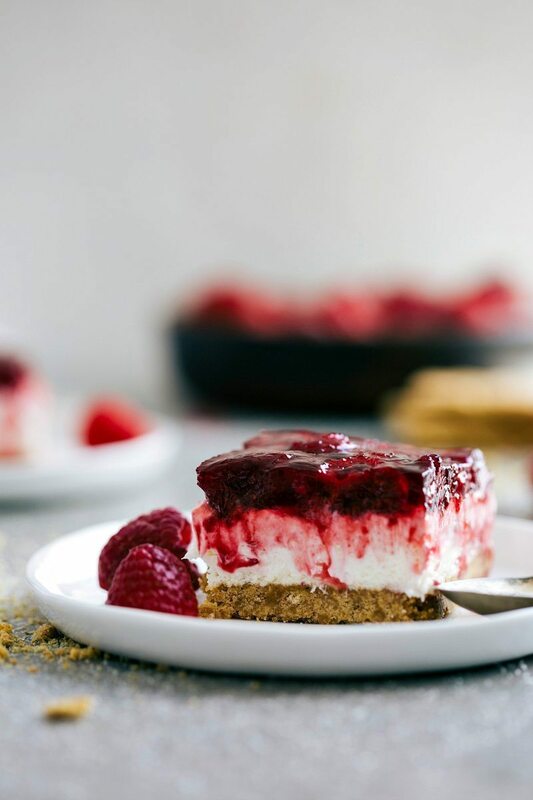 A thick graham cracker crust with a layer of no-bake “cheesecake” topped with quick-set raspberry filled jell-o. 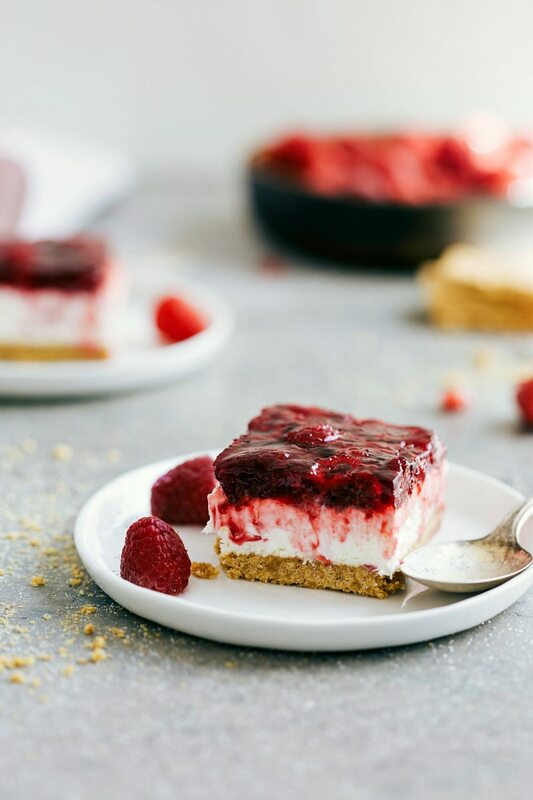 These Raspberry Jell-o Cheesecake Bars make an easy, crowd-pleasing dessert! We’ve moved into our new place, but we’re still quite aways away from being totally unpacked. 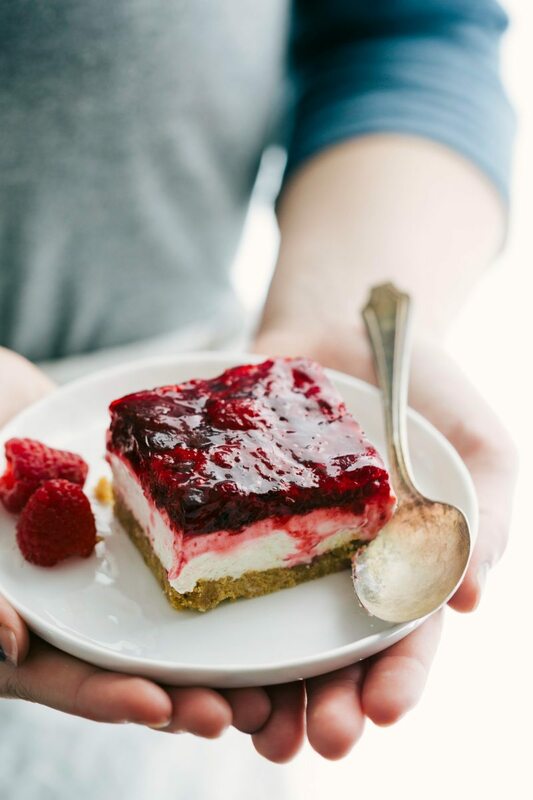 You know, because I’m spending time making raspberry jell-o cheesecake bars instead.. ? One of the things we bought to make the move easier was a bunkbed for the two boys to share. We found one on a great deal and I showed them pictures as we were waiting for it to get shipped to our home. To say they’ve been excited is an understatement. Finally the day arrived and the bunkbed was delivered. Both boys stood at the door in total anticipation and watched as the delivery guys brought it in. By the time the final piece came in, both boys were beyond themselves excited. I had to get a video of their excitement! As soon as I started the video, Grey was jumping up and down so vigorously that his pants slid right down to his ankles. Without even skipping a beat, he bent down and pulled them up and continued to jump and squeal about the bed. I can also tell you that making this dessert was *almost* as popular as purchasing that bunk-bed. The boys love this treat. I don’t let them have a whole ton, but the piece they get each day is inhaled within seconds! 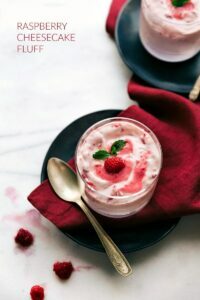 This recipe is adapted from the famous “Strawberry Pretzel Salads” that proliferate the internet. If you’ve never had a strawberry pretzel “salad” then you are seriously missing out. Strawberry pretzel salads are hands-down one of my favorites and I make them (or this variation today) several times every Spring/Summer. I’ve made enough changes on the original that I think it deserves being shared on this site. Although I don’t know the original creator of these dessert bars (also called a salad? ), I’m sure that person would be one of my very best friends. All in all these bars have a few steps, but they are all super quick and simple. I promise these are well worth the time and efforts — you’re going to LOVE them! 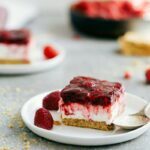 Simple raspberry jell-o topped cheesecake bars with a delicious buttery graham cracker crust! Preheat the oven to 350 degrees F. Lightly grease a 9 x 13 pan with nonstick cooking spray. Crush the graham crackers in a blender or food processor until they are in crumbs. In a large bowl, mix together the graham cracker crumbs, melted butter, and white sugar until combined. Press this mixture into the bottom of the prepared 9 x 13 pan and bake for 8-10 minutes. Meanwhile, beat the cream cheese in a large bowl until light and fluffy. Add in the sugar and vanilla extract and beat until combined. Fold the cool whip topping into the mixture. Spread this mixture onto the COMPLETELY cooled graham cracker crust. Smooth it evenly and so that none of the graham cracker crust is exposed (the jell-o will seep through.) Place in the freezer while you prepare the last layer. Bring 2 cups of water to a boil. Add in the gelatin and whisk until combined. Pour in the bag of frozen raspberries and stir until those are combined. Immediately (don't let this jell-o layer sit) pour it on top of the cheesecake layer and smooth it to make 1 even layer. Cover tightly and place in the fridge until completely set. To get 40 servings, cut rows of 8 x 5. These make small pieces, so of course, feel free to cut them larger! 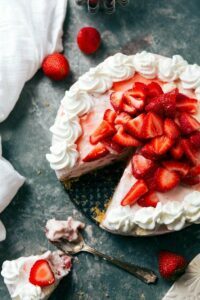 Recipe inspired from this Strawberry Pretzel Salad. Hey girl love the story about the boys! So cute! And these bars look amazing! yummy! Thank you for your wonderful newsletter. I am looking forward to making the Raspberry Jell-O Cheesecake Bars. They look and sound so yummy. 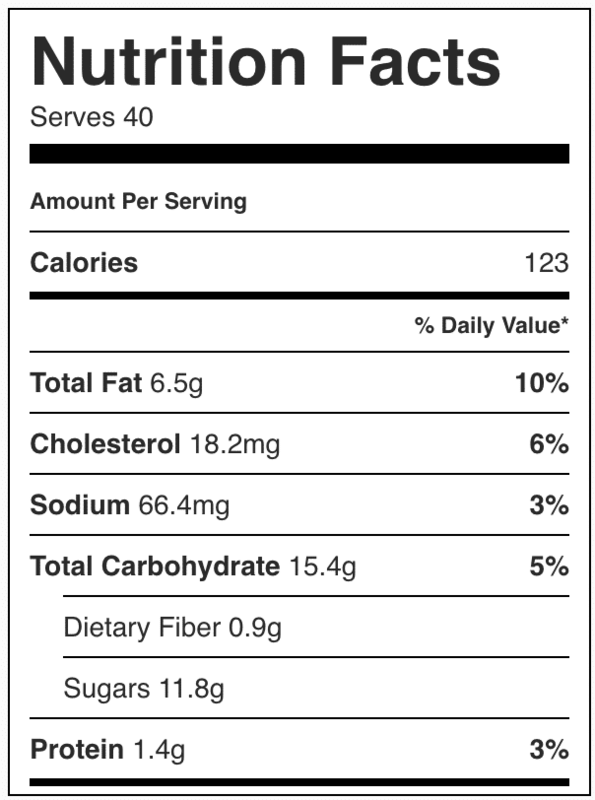 There is only one thing that I would like to suggest: when listing sugar as an ingredient say: granulated sugar not white. Experienced cooks know that you mean granulated only confectioners’ [powdered] sugar is white also. Thanks for listening. 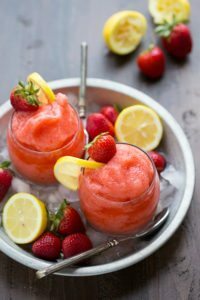 These pictures are so delicious looking, I definitely have to try this! I’m located in Islamabad, Pakistan and we can only get cream cheese SPREAD, not the brick kind. Any idea if that will also work, or should I not bother trying? Also, can I substitute any whipping cream for cool whip? Thanks for sharing that adorable story about your boys. I have two boys too, so I can imagine the energy! It must have been hard to get them to actually go to SLEEP in that bed after such an exciting day! Your boys are the cutest 😉 I love when you start your post talking about them! You’re so sweet! They are a blast! I used blueberry because raspberry is hard to find in this time of year. The taste was sublime. Oohh raspberry sounds amazing with this too. I’ll have to try! OMG! Made this for supper last night for my Sister and Brother in law. What a hit!! My sister is taking this recipe back to Florida with them! Absolutely delicious! Hello! I was curious as to how far in advance I can make this? I was wanting to make it two days in advance, do you think it will be soggy mess? I wouldn’t make it more than 1 day in advance; enjoy! 1 brick of cream cheese is 8 ounces so you’ll use 1 brick and 2 ounces from another brick. I haven’t tried it with just 8 ounces 🙂 Enjoy! Our Jello doesn’t go by ounces here, is it the one that uses 1 cup of hot and 1 cup of cold if you were to mix it up as per instructions? Also our Cool Whip doesn’t come in ounces, is that the large container that holds about 4 cups or the smaller one that holds 2 cups? The smaller one that holds 2 cups 🙂 And the 1 cup hot, 1 cup cold sounds like the right amount of jell-o. Enjoy! I’ve never seen a 6 oz pkg of jello. Do I use 4 of the 1.5 oz boxes?